Tennessee, as do many states, has a winter trout stocking program to provide trout fishing for people who would normally not have the opportunity to fish for trout because of their lack of proximity to cold-water streams. A couple of days ago, I made it to our local fishing hole at Cumberland Mountain State Park. Byrd Lake is stocked every winter. 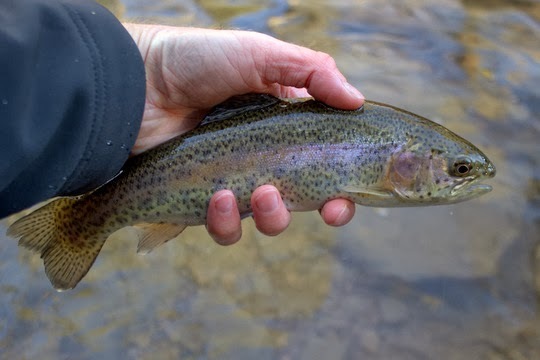 My preference is to fish it in the spring once the fish have had a couple of months to grow (and color up a bit) but even now the trout can provide an hour or two of entertainment close to home. Fishing can be good both in the lake and in the stream above and below the lake. I enjoy fishing the stream below the lake as it is a very short walk compared to the jaunt required to get above the lake. The fish are small but generally eager. 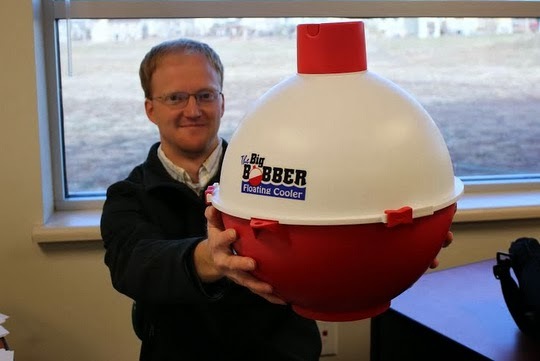 As fresh stockers, the fish won't require your fly fishing Ph.D. nor your midge box. Instead, a few simple wet flies will generally suffice. 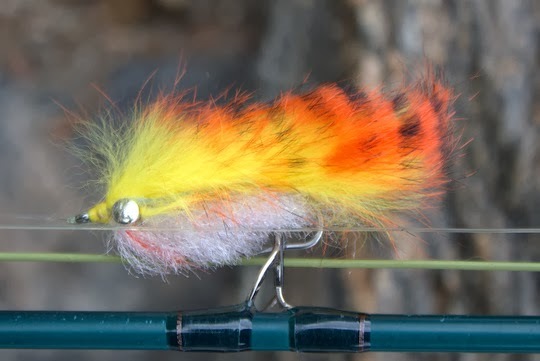 My favorite flies are Wooly Buggers and Simi Seal Leeches, preferably with a bead head. I fish them on the swing most of the time although occasionally dead drifting works as well. If you are in the area and want to get out, try fishing at Cumberland Mountain State Park. You will be pleasantly surprised at how good these fish look considering they are fresh stockers. I want to wish each and every one of you who spend time reading the Trout Zone a Merry Christmas. Thank you for your support over the years and for taking the time to read my ramblings. Here's wishing each of you many days on the water and lots of big fish in 2014!!! So this last week wrapped up my time as a teacher, at least so it would seem for now. The way things are looking, I'll be teaching again in a couple of months but in a different way. Unless something major changes, I will be offering guide services in Tennessee including in the Great Smoky Mountains National Park. Looking back, being a teacher has some benefits, at least if you are a regular classroom teacher. On the last day of school, students usually bring cards and small presents to the teachers. This year, one of my students brought a large box with my name on it. I wasn't sure if that was a good thing or not. Upon opening it, I found what is one of the best presents I have ever received. After the recent arctic outbreak here in Colorado, I'm sure that most people don't want to be reminded of how good they could have it. You know, those nice fall days where the colors are peaking but the daytime temperatures are still reasonable...? Or maybe you will think of spring with its increasing BWO hatches and hungry trout. Anyway, whatever it is, I discovered I still have some fall pictures left, quite a lot of them actually. So here are a few more of my favorites from back in October. As November gave way to December, there were still some great fishing opportunities to be had locally. Then it cooled off just a little. From highs in the 50s and even 60s, we are now going to be lucky to get to 10 or so above zero. The low temperatures last night were well below zero. As you can imagine, open water is going to be closing quickly now. 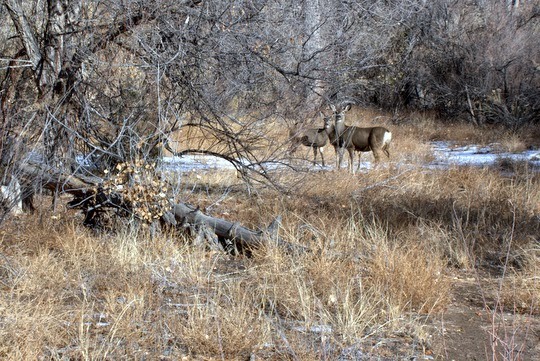 Over the Thanksgiving holiday, I made a trip over to El Dorado Canyon to find some solitude. 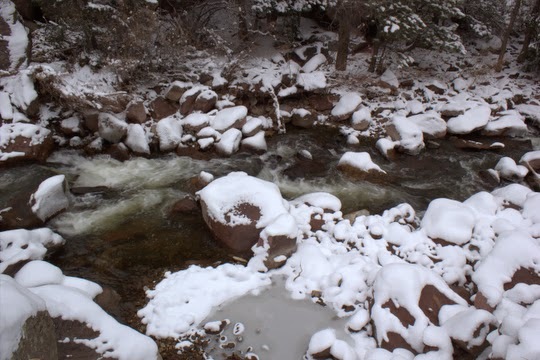 A recent snowstorm had both coated the stream banks and chased away other anglers. I'm just fine with that. If it takes a cool down to get some water to myself so be it. 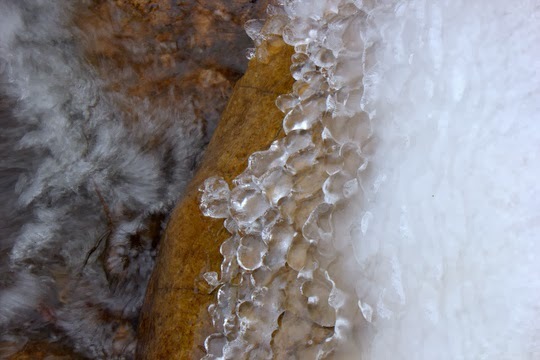 Rocks were already gaining ice caps, and this was before our recent plunge into the deep freeze. 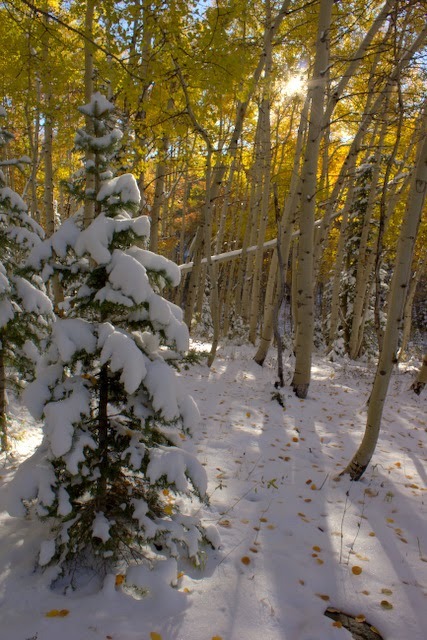 The snow on the plains had barely been a couple of inches. In the canyon it had piled higher though, up to 5 or 6 inches. Scrambling up and down the steep stream banks was an adventure but I just took things slow and made sure to not take any serious falls. This included NOT wearing waders, but instead just wearing hiking boots. Long ago, it became obvious that wading boots encourage me to take risks that I shouldn't even be considering. My solution now is to just stay out of the water. Yes, there is less water I can reach, but it also forces me to creatively improve my casting as well as try new methods. I tend to fish streamers a lot more when I'm stuck on the bank which isn't too bad of a trade off if you ask me. Anyway, as I walked up the access road and stared almost straight down to the stream, the thought of scrambling down was a bit frightening. Eventually, I was almost to the top of the steepest stretch before I found a decent path down to the water. Here, the danger factor was in the "broken leg" range if I fell instead of "likely death." Oh well, surely I could drag myself with my hands out of the canyon. I'm glad I snuck down where I did. The browns were small but willing. Getting around the banks was a bit tricky, but I navigated enough stream to feel that the scramble down had been worth it. When I discovered the road was now much easier to get to, I decided to jump out and head back down the canyon. Eventually I found myself fishing a hole near the car as the sun started to sink below the horizon. 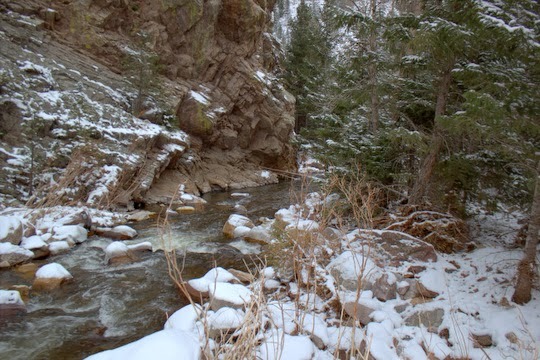 Already shaded by the clouds and canyon walls, the stream was becoming even darker. Finally, as the temperature was rapidly dropping, one last nice brown was eager to eat. A quick picture, and the fish was back in the water, and I was headed to the warmth of my car. One of the highlights of fall fishing, at least for me, is finding reliable emergences of Blue-winged Olives. 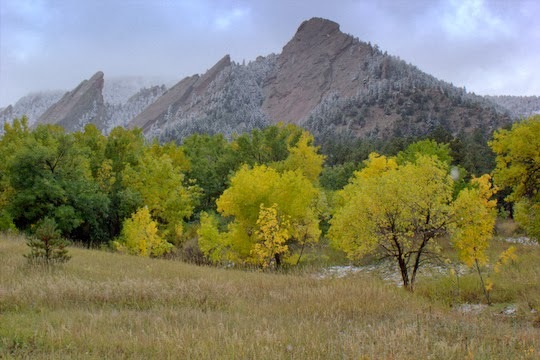 Back in Tennessee, the small mayflies would show up on occasion, but here in Colorado it is not an if or a when but rather a given. The little BWOs are so reliable on some waters that you can tell when the hatch is about to start based on when all the fishermen show up. In other places, the hatch is a guarantee, but the timing might be a bit more unpredictable. My first memory of hitting this hatch in Colorado is from Clear Creek last September. The little browns were rising with abandon in the shaded pool where the stream hugged the cliff on the south bank. Every now and again, a larger specimen would rise, leaving a subtle rise that was clearly the work of a more experienced trout than most of the splashy efforts I was seeing. I fished a little Sparkle Dun, a #18 if my memory is correct, and the trout would eat if I showed them a clean drift. Last spring, one particularly drizzly day found me torn between the BWOs and throwing streamers. Most people who know me can guess that streamers won. I'm still not sure whether or not that was the right choice. Every single pool had numerous fish rising to bugs struggling to get off the water into the chilly mountain air. The meadow stream eventually yielded a fine brown to my streamer, but I still wonder how the day would have been if I had fished a BWO the whole time. Most recently, on a trip to the Arkansas River tailwater in Pueblo, I stumbled into one of the more epic hatches I've been blessed to fish. Deciding to put my Colorado State Parks sticker to good use, I parked at the Valco parking lot. An early morning departure had me rigging up in air temperatures that had just edged above the freezing point. A fleece kept me warm while I started working my way down the river to explore new water. The number of fishermen out was impressive, but finally I started to find water I could call my own. Deep water nymphing was turning up very few fish, and I began to wonder if the decision to get up ridiculously early and drive all the way to Pueblo was a sound one. The occasional tug on the line from small to average stockers was not really helping my mindset. Once it warmed up, my mood gradually improved however. I stumbled upon a family of deer in the brush along the river and was reminded to look for the little things that make a trip great. It wasn't before I had finally wandered down close to the bridge that I noticed a few fish rising in the slack water along the far bank. Refusing to acknowledge the possibility that it was time to change tactics, I stumbled on down the river. 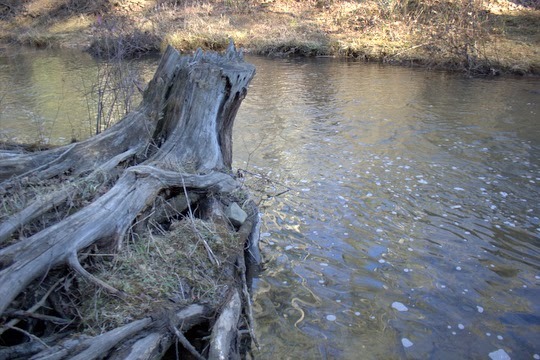 Crossing at a point of shallow riffles to search for that deep run that I just knew had to exist and would be loaded with big trout, I saw a few BWO duns floating along. That's what they were eating back there. Still stubborn, I found a pool perfectly suited to my nymph rig. Running the flies through time after time, I saw a few rise rings just downstream, then another a bit closer. Not wishing to ignore the obvious for too long, I walked a few yards down to a nice long flat with several rising trout. Digging through my fly boxes, I chose a #20 Parachute BWO with a hi-vis post that I tied a few months ago. Extending my leader to end in 6x tippet, I was now ready to go head-to-head with these annoying trout. Since when does any self-respecting trout ignore my delicious sub-surface offering of midges and BWO nymphs anyway? After a few casts that did not produce a hit, I paused to observe. Suddenly it was obvious: the fish were rising in a consistent rhythm. Somehow I was drifting my fly past in between each rise. I waited for a trout to rise, then waited for the next rise. Finding the rhythm, I waited until just before the next rise and then made the cast. 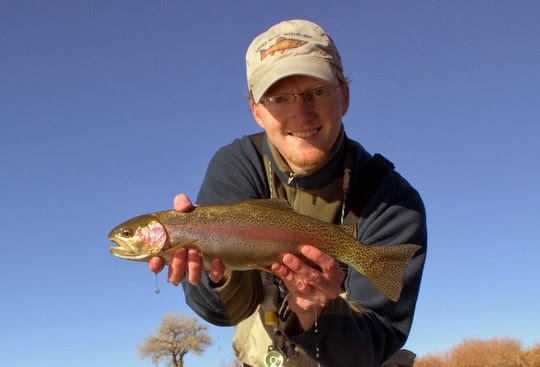 The little fly floated for all of 3 feet before a chunky rainbow nailed it. The next couple of hours proceeded about the same until I started to get hungry. Wandering back upstream, I came across the same little flat where I initially spotted rising fish. A huge wake from the back indicated that I had moved just a little too quickly for at least one large rainbow's liking. Slowing things down, I decided to retie. I had lost the Parachute pattern some time before. Several other patterns had fooled trout, but I wanted something extra for the large risers I was now stalking. A #20 Comparadun seemed appropriate. Testing the knot and checking the drag was the last step before beginning to cast. Several casts later, another wake quickly exited the exposed shallows. Slow down, find the rhythm. Refocused, I waited. There, right against the bank. The drift was particularly difficult since I was casting 35 feet across 2 different current seams and trying to drift the fly in the calm water outside the last current seam. Again and again I expected to spook the trout, but somehow luck was on my side, and it just moved up a couple of feet before rising again. Finally, the stars aligned. The fly dropped just outside the main current, drifted a foot and a half, and was inhaled. Six more inches and it would have started to drag. Knowing my luck had turned gave me more confidence. The beautiful 14 inch fish was not the owner of one of the large heads I had been watching another 20 feet upstream. Releasing the fish, I again paused and observed. Two large trout, the kind that are big enough to get your pulse racing, were rising a good 45 feet up and across. To get a good drift, I took 2 steps forward...and saw yet another wake zigzagging frantically away. One more chance. Finding the rhythm, I waited for the trout to rise once more, paused, then made one solid backcast before sending the fly on its way. The fish ate a natural 6 inches to the left of my fly. After a short pause to avoid spooking the fish, I lifted the line off the water, bought time with two false casts, and presented the fly again. This time the fish rose a foot below my fly. This went on for probably 30 casts. Every cast I expected to spook the fish, but apparently it was a day for fishing miracles. Finally, the fly settled in 12 inches above the fish. My adrenaline shot through the roof as that big head I had been watching slowly appeared below my fly. As I lifted the rod, I knew that this trout was mine to lose. The fish was smart, but it was also stuck on that shallow flat. Once, it made a heart-stopping run towards the fast riffles below, but somehow I got its head turned. When I finally slipped the net under the fish my day was complete. I released the gorgeous rainbow trout after getting a good picture, cradling it gently until it slipped off to battle another day.